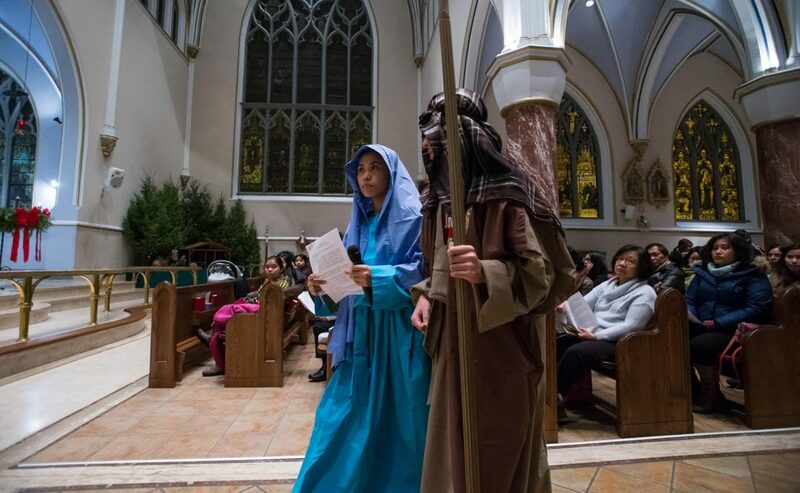 VANCOUVER, British Columbia (CNS) — Two figures dressed as Mary and Joseph made their way down the center aisle of Vancouver’s Holy Rosary Cathedral. At various points, they stopped and asked a parishioner playing the part of an innkeeper for a place to stay. Invariably the reply was negative. Finally, the two figures reached the foot of the altar and asked the congregation if they had any room for Christ. The congregation said they did have room for Christ, and only then did the entrance procession for the first Simbang Gabi Mass of the year begin. Simbang Gabi refers to nine Masses in honor of Mary, traditionally celebrated in the nine days before Christmas by Filipino Catholics around the world. The Filipino community of Vancouver began the novena with a Mass celebrated Archbishop Michael Miller at the cathedral. The scene of Mary and Joseph asking for a place to stay was a standard feature on the first night of Simbang Gabi. It would help the faithful focus on making room for Christ in their hearts. Archbishop Miller told the congregation Mary and Joseph repeatedly heard that there was no room to spare because the people they met did not want to be bothered. The world was in darkness and needed the light of Christ, he said. Suggesting ways one could bring Christ’s light to others, the archbishop said the faithful could bring someone struggling with their faith to Christmas Mass. “Don’t leave them alone,” he said. “Through you, Christ wants to reach out and touch them. “We’ve all received so much from him, let’s not hoard that light,” he said. The remaining eight Simbang Gabi Masses would be celebrated in a different Vancouver parish each night. Host parishes would assemble a special choir for their evening of Simbang Gabi. Celebrating the Masses in the evening was a slight deviation from tradition. Normally, Simbang Gabi Masses would be celebrated at dawn. Michael Goco, a member of the Filipino Catholic organization Sambayanang Pilipino Society of British Columbia, which organized the novena, said the decision to celebrate Simbang Gabi Masses in a different parish each night was practical and symbolic. The tradition of Simbang Gabi Masses could be traced back to the arrival of Spanish missionaries in the Americas and the Philippines. At the time they had a tradition of celebrating pre-Christmas novena Masses in honor of the Annunciation. Those Masses were known as “Misa de Gallo” or “rooster Mass,” because they were celebrated at dawn. Pope Sixtus V gave Augustinians in the Americas permission to celebrate the Misa de Gallo on the nine days leading up to Christmas. Spanish evangelizers in the Philippines continued their tradition of celebrating nine days of Misa de Gallo and found it was a good way to spread the faith to the people. The same evening as the Vancouver Mass, thousands of Filipino Catholics from throughout Southern California celebrated with a special evening Mass at the Cathedral of Our Lady of the Angels in Los Angeles. Archbishop Jose H. Gomez was the main celebrant of the liturgy, sponsored by the Filipino Ministry of the Archdiocese of Los Angeles. The Mass was preceded by the traditional “Parade of Parols,” or Christmas lanterns, of more than 100 parishes. Since 1986, Filipino Catholics have organized an annual Simbang Gabi novena throughout the Archdiocese of Chicago. Every novena, which takes 12 months to plan, becomes more popular, with an average of 45,000 people attending over the nine days. Six percent of the archdiocese’s population is Asian, and many of those are Filipinos. This year, 66 churches in all parts of the archdiocese will participate in Simbang Gabi. Unlike in the Philippines, where the novena Masses are held at dawn, the Masses in Chicago are held in the evening. Children usually carry parols in opening processions during the service, and many people wear traditional Filipino clothing. One of the highlights of the novena follows Mass when participants partake of traditional Filipino food. The Archdiocese of Galveston-Houston has an extremely active Filipino Catholic community, and last year nearly 30 parishes from Conroe to Nassau Bay, Texas, offered Masses for Simbang Gabi, leading up to an archdiocesan Mass. In Houston, like Chicago, the Masses are in the evenings. “This beautiful longstanding tradition of the Filipino community … is a beautiful influence you can have on the diocese,” said Cardinal Daniel N. DiNardo. Contributing to this story were Joyce Duriga in Chicago and James Ramos in Houston.